I believe Audiobooks have the power to change the world. Can you imagine if all those who have difficulty reading were to discover that they actually loved reading, that books could open up a whole new world for them, and they could just listen to the words instead of struggling to make sense of the letters on the page? Those who do not like to read could substitute the storytelling of books for the time they use to engage in stories on tv, radio or stage. They could engage more easily with assigned reading, current affairs, and popular literature. In my mind, the group of people who have difficulty with conventional book consumption includes blind people, but the visually impaired community in particular can benefit from audiobooks. I myself only have one eye that has sufficient vision to read, and thus find that “good eye” doing a lot of straining all day long. I can not speak for those who read in Braille, for I do not, but I so appreciate being able to consume great literature by listening instead of struggling and straining to focus my eye on the little tiny letters. Millions of them. While I have found audiobooks do not provide the built in reminders on proper grammar and spelling that comes with physically reading sentences from a screen or page, they do allow for plenty of opportunity to expand vocabulary, incite new ideas, engage in storytelling, learn how to structure sentences, and many other productive lessons. At this point, Audiobooks are established well enough that a listener could basically tune in forever and never run out of great material. I have been an avid audiobook reader for over three years (how I wish they were so accessible when I attended high school and university! ), and I never have any trouble finding something new even though not every release is recorded into audio format. One of my favourite things about audiobooks is finding a great narrator. While a bad narrator has the potential to ruin a good book, a great narrator brings any story alive. They can make it all into a grand adventure. I know a bad book can not exactly be salvaged by a great reader, but it can sure help. The best scenario is to come across a great book coupled with a great narrator, for this just equals a wonderful and memorable experience. 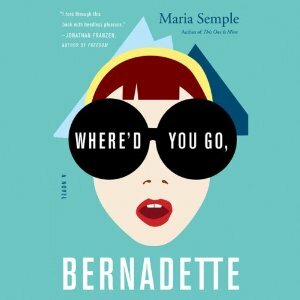 Recently I decided to listen to Where’d You Go Bernadette by Maria Semple, narrated by Kathleen Wilhoite. Her voice, her tone, her enthusiasm, her acting, made for the best audiobook experience I have ever encountered. So now I feel compelled to let everyone know they should check this recording out if considering dipping a toe into the unfamiliar waters of walking while reading, cleaning while reading or reading with your eyes closed! Audiobooks have absolutely changed my world. They have allowed me to read many more books at a greater speed and depth of understanding than I ever could with the vision I have. I just hope the rest of the world one day realizes and embraces this resource for the vast library of knowledge and literary accessibility that it provides. This entry was posted in Muse Reviews, Reflection and tagged Audiobooks, blind, braille, Change the world, Narrator, reading, Reading difficulties, Vision, visually impaired. Bookmark the permalink. My husband recently became legally blind due to end stage glaucoma. He had been battling glaucoma since he was in his thirties. He’s only 52. Every doctor we have been to is amazed at how young he is and how far his glaucoma has progressed. Even more so that he has it so young! Anyways, my husband has always been a reader. He loves to do research so when he lost most of his eye sight it was the hardest thing for him. He’s worked with the Voc Rehab in Kentucky and is currently working with the one in Indiana. They have given him devices, such as the Davinci, to help him read. They work to an extant. The Davinci will read the text to him when his eyes strain. And he’s a member of the Talking Books program with the Library of Congress. I never knew the power of audiobooks until we went through this experience. My husband is learning braille but he does better with audiobooks. Now I want to get all of my books published in audiobook and braille format. It’s so amazing what audiobooks can do for those with vision problems. Audiobooks aren’t just for those who want to read on the go. They are a real blessing for people like my husband who lose their sight and love to read. Thanks for your comment Alison! So glad that your husband has found joy in audiobooks too! Audiobooks will revolutionize the world. And so much has changed in the past few years. Remember good old books on tape? Barely any books were made into them, if they were they were abridged and expensive. Now with things like Audible audiobooks are much more accessible. Yikes, books on tape! So glad we live when we do and they are so accessible! You can find almost every book published now in audio format. I love it. Even though I don’t have any impairments, I enjoy listening while I go about doing other things. Great post! Loved everything you had to say. Audiobooks are so important. My daughter was a struggling reader but my oh my as a listening reader she was/is amazing. Listening to a book is not less than, it is not “cheating”, it is not a reflection on a persons ability to to experience a story. Heck, I am still working on being a good listening reader. Thanks for the recommend! I just happen to be looking for my next book to listen to. You should check out the audio books Jenna Lamia reads (if you haven’t already! )…she’s pretty darn good, too. Cheers and happy ArmChairBea! THIS IS GREA TO HEAR! The whole teenager not doing their reading homework thing is something I would love to see audiobooks fill a mass market gap for. Definitely not cheating! For the last few years of his life, my dad, an avid reader lived for his audiobooks. I haven’t been able to get into them often, myself, but I did love the print copy of Where’d You Go Bernadette? Wonderful novel! Thank you for your great post on audiobooks. I’ve tried listening to a few (especially during long drives) and I found that a great narrator can make or break the experience for me. As someone involved in the blind community, I offer another thumbs up to Audiobooks. In true words, they are life changing. Serious super dad here! I still envy how you do so much with your time! Haha, it is my day-time job. Before I made the switch from video games to books, it was amazing to work with blind gamers. Accessibility has taken off, and it really doesn’t take that much to make something accessible and open to a larger audience.